So you've been to Stirling Castle, scaled The National Wallace Monument and stepped back in time at The Battle of Bannockburn Visitor Centre - now what? Try visiting some of these hidden gems in and around the city of Stirling, as recommended by the members of our iKnow Community. The Church of The Holy Rude at the top of Stirling Old Town has witnessed over 900 years of history. It was the crowning place of King James VI of Scotland, and even bears bullet marks from past battles. Visit for peaceful reflection, impressive architecture and stunning stained glass windows. Make sure to explore the atmospheric cemetery too, which offers views across to Stirlingshire and The Trossachs. Visible from the castle esplanade but often overlooked by first time visitors, King's Park was once a royal hunting ground. Still a place of leisure, it's now home to a skate park and BMX track, a fantastic outdoor play area, tennis courts and lots of green space to enjoy. The park is also neighboured by Stirling Golf Club. The Engine Shed brings Scotland's built heritage to life through interactive exhibits that will really get you thinking about the world around you. This family-friendly exhibition space offers an in-depth look into building conservation and offers a range of creative workshops for all ages. Just north of Stirling, Briarlands Farm is perfect for a family day out. Traditional farm-themed fun, such as feeding the animals, picking fruit and mini diggers are combined with other activities such as riding the zip wire, archery and ceramic painting. Refuel at the team room to enjoy treats made from local produce, including the farm's own strawberry jam. Take a mini road trip north of Stirling through 'Rob Roy Country' on the BLiSS Trail to enjoy the beautiful scenery of Loch Lomond & The Trossachs National Park. Explore Balquhidder, Lochearnhead, Strathyre and St Fillans by car or by bike and look out for over twenty specially commissioned pieces of artwork on the way. Cameras at the ready! 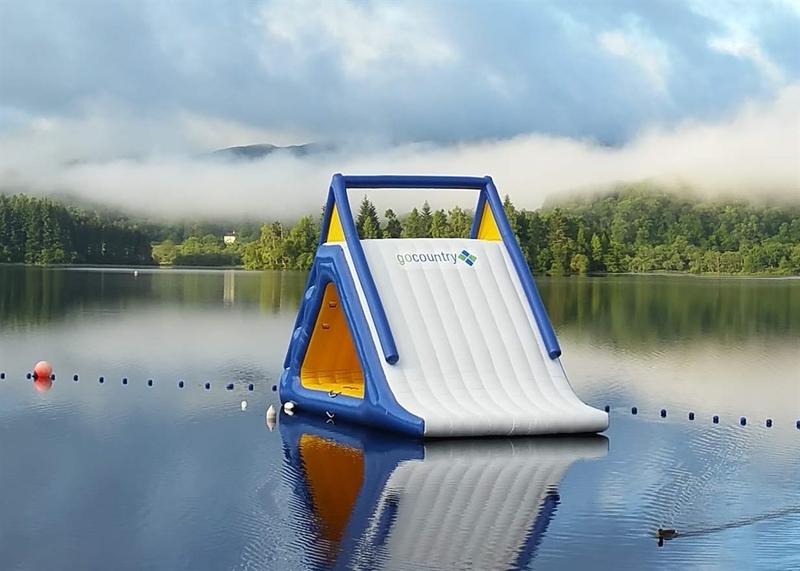 Make a splash at Go Country on the edge of Loch Ard, which is located east of Stirling in Loch Lomond & The Trossachs National Park. Water-based activities you can try include an inflatable water park, canoeing and cliff jumping into a loch! Back on dry land the fun continues with orienteering, climbing, abseiling, mountain biking and more. Tucked down a lane in the beautiful Victorian spa town of Bridge of Allan, The Hideaway Café is a relaxed place for a coffee, cake or brunch. The décor gives a nod to Scandinavian style, and the tasty dishes are worth snapping a photo of before you tuck in. Located by Stirling Castle, the The Porrtcullis Hotel is the perfect place for a pub lunch, whether you want to dine out in the beer garden or indoors by the fire. This traditional inn serves up classic dishes such as steak pie, breaded fish and chicken stuffed with haggis, as well as lighter meals like paninis and wraps for lunch. Journey north east of Stirling to Venachar Lochside and you won't be disappointed. Located in Loch Lomond & The Trossachs National Park, this waterside restaurant is an oasis of calm, serving up meals made with fresh Scottish produce against a stunning backdrop. Cambuskenneth Abbey can be reach by road or on foot from Stirling. The abbey grounds are free to enter and feature a magnificent 13th century bell tower as well as church and monastery ruins. It was the burial place of James III, and amongst the graves there is a Victorian tomb created in honour of him and his wife Queen Margaret. Soak up a bit of culture at the Macrobert Arts Centre at the University of Stirling. Over 400 performances take place here across the year including dance, comedy, music, and art exhibitions, as well as a year-round film programme. The centre offers a particularly family-friendly programme featuring productions and workshops especially for kids. Offering great views of Stirling, the Forth Valley and The Trossachs, Dumyat is a wee hill at 1371 ft (418 m) but it packs in a lot of character. The most eastern of the rolling Ochil Hills, it can be scaled in a couple of hours. See more walks in the area, including city and country walks, in The Wonders of Stirling eBook.